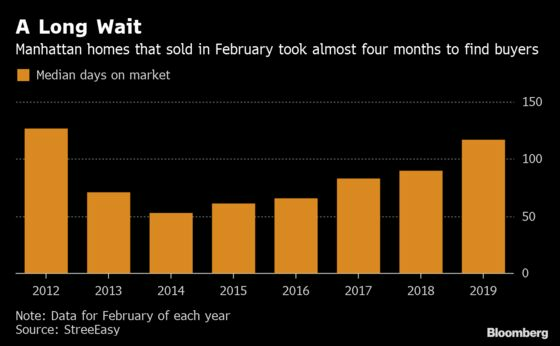 (Bloomberg) -- Manhattan homes that sold in February sat on the market for the longest stretch since 2012, a sign that sellers aren’t dropping prices enough to reach buyers, an analysis by StreetEasy shows. Properties were listed for a median of 117 days before going under contract, up from 90 days a year earlier, according to the study. Sellers of homes that were still available shaved a median of 4.6 percent off their asking prices. Discounts will have to get deeper if those owners want to seal a deal in a market that’s crowded with choices, said Grant Long, senior economist at StreetEasy. StreetEasy’s index of Manhattan home values, a measure of closed purchases, dropped 4.3 percent from February 2018, an “eyebrow raising” amount for this time of year, according to Long. Times will just get tougher for sellers: He expects inventory, which rose 12 percent from a year earlier, to reach a record this spring. 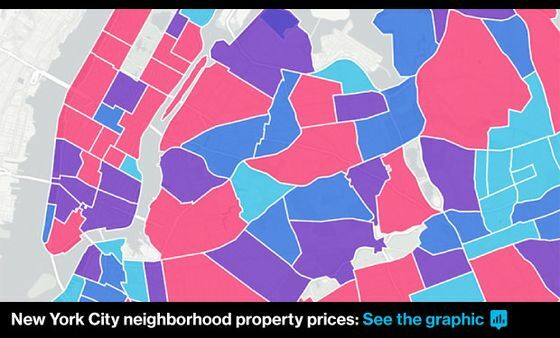 Explore New York’s property market here.